Machine mounts are a fast, easy, and precise way to level your machinery and equipment. While significantly reducing noise, machine mounts also provide up to an 80% reduction in transmitted vibrations. This contributes to improved operation and quality, as well as isolating precision instruments. WHAT ARE THE ADVANTAGES OF USING MACHINE MOUNTS? Machine mounts easily attach to machinery and equipment during initial installation, or when moving machinery from one place to another. No drilling, cementing or bolting machines to the floor. Simply attach the mount, adjust the leveling bolt, and tighten. The precision fit between the leveling plate and rugged base leaves no room for horizontal sway. Horizontal forces and vibration are transmitted directly to the shock absorbing rubber sole. 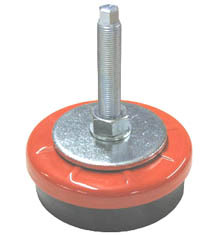 The heavy-duty mounting plate and finely threaded leveling bolt allow for accurate leveling. 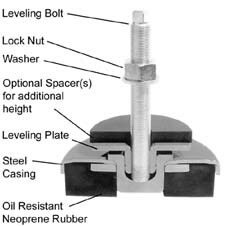 Because the neoprene rubber sole provides an excellent friction barrier against creeping or walking, PS&E machine mounts meet all OSHA anchoring requirements. Improved machinery operation, product quality, and isolation for precision equipment are just a few of the advantages to using machine mounts. The dampening effect of our machine mounts provides up to 80% reduction in transmitted vibrations. Vibration reduction also means an improved working atmosphere in surrounding areas. Reduction of noise at critical dB levels can, in some instances, permit compliance with OSHA noise level standards in a cost-effective manner. Because equipment mounted on machine mounts is not bolted to the floor and easy to pick up and move, significant savings of both time and money can be achieved when machinery relocation is necessary. Based on the load per mount and type of machine, select the corresponding mount. Keep the following guidelines in mind. Note the thickness of the machine base. Extra long leveling bolts may be required. Select the mount size that will bring the load to within 50-100% of the maximum load capacity for the mount. For fast cycling Injection Molding Machines a load per mount of 50-60% of the maximum mount load capacity is recommended. Min. to Max Load per Mount 400-1100 lbs. 825-2200 lbs. 1650-4400 lbs. 3300-8800 lbs. 6600-12,000 lbs. Diameter 3.15" 1.80" 6.25" 6.25" 7.875"
Height to Top of Leveling Plate 1.50" 1.80" 2.10" 2.13" 2.20"
Max. Machine Base Thickness 1.50" 1.80" 2.10" 2.13" 2.20"
Dimensions M12 x 8" M16 x 8" M20 x 8" M20 x 8" M20 x 10" M20 x 10"
Click here for more information on Machine Mounts.